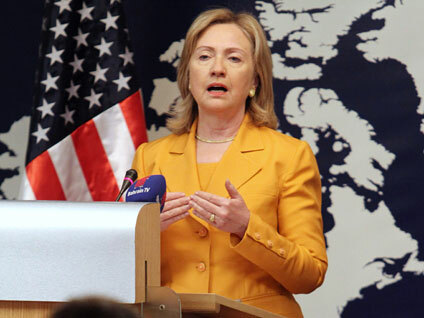 At a town hall meeting appearance in Manama, Bahrain on Friday, Clinton denied intentions to run for either president or vice president on the ticket with President Obama, who defeated her in the 2008 Democratic presidential primary. Some experts have also speculated that she could replace Robert Gates next year when he retires as secretary of defense. "I think I will serve as secretary of state as my last public position," she said. Clinton's career has included not only her current position as secretary of state, but also eight years in the Senate representing New York. Clinton has repeatedly laughed off rumors that she may seek the highest office in the country, and she was notably out of the country during the midterm elections when Democrats lost control of the House. When her current position is over, Clinton "would like to continue working to improve lives for others," she said, adding that she will "probably go back to advocacy work, particularly on women and children and probably around the world." This marks the first time Clinton has publicly discussed alternatives to political office in her future. In returning to advocacy work, she could follow in the footsteps of her husband and former President Bill Clinton, who has largely turned to humanitarian work through his Clinton Foundation since leaving the White House. Mrs. Clinton has formerly worked extensively for the rights of women and children. She went on to note that while she has had a "fascinating and rewarding public career," she particularly enjoyed her time as a lawyer for the Children's Defense Fund, which advocates for abused and neglected children, as well as her women's rights work, according to Reuters. "I feel very lucky because of my parents and then my education, the opportunities that I've had, so I would like to continue working to improve lives for others," she added. In addition to personal passions, Clinton also noted the strain of the job of president as a deterrent towards seeking further election. "Every president, if you watch what they look like when they come into office, you can see their hair turn white because it's such a hard job," she said.